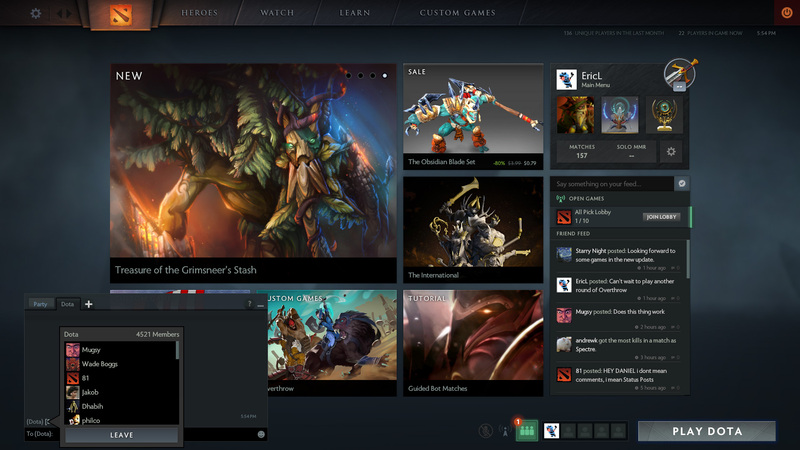 Today we are announcing the Dota 2 Reborn beta, which brings with it a new interface, new engine, and Custom Games. Everything in the dashboard has been redesigned utilizing a new UI framework and the engine that powers the game has been fully replaced. On this page we will be giving you a preview of the new interface. Early next week we'll be talking about Custom Games, and later that week we'll conclude with various details about the new engine and launch the open beta. 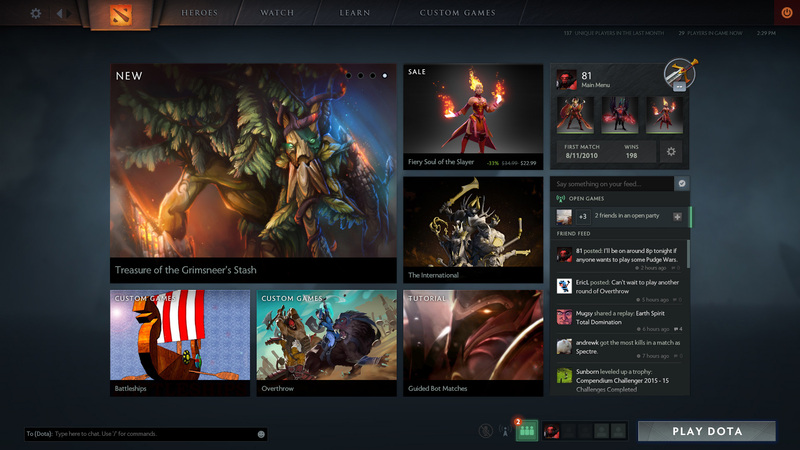 Welcome to the new Dota 2. We have rebuilt the entire dashboard from scratch to make it more intuitive and easier to use. We're using a new UI framework which enables us to make the game more lightweight while also building a stronger foundation for new features here and in future updates. 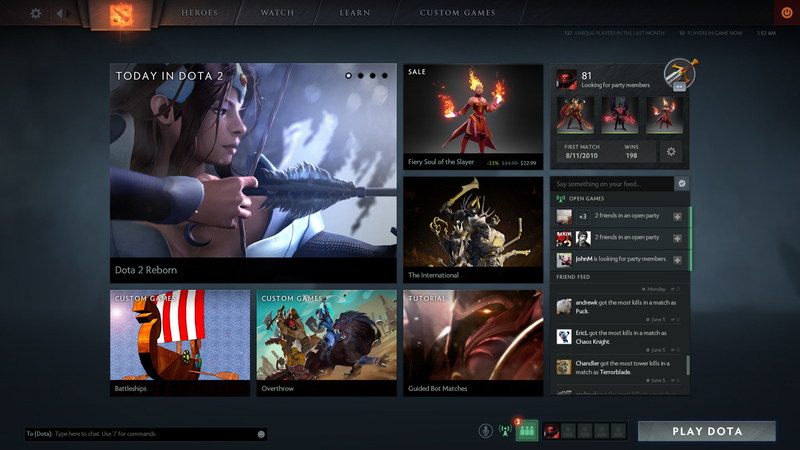 The "Play Dota" button is always available, no matter where you are in the new interface. 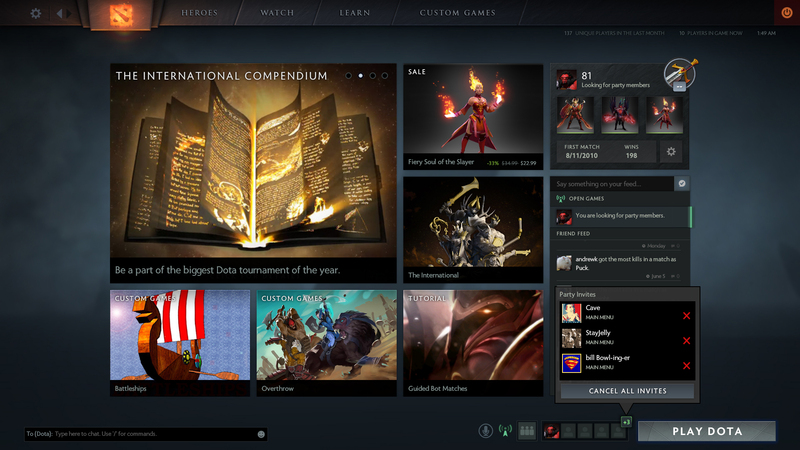 Click "Play Dota" to choose your game mode or lobby, begin your search, and then go right back to what you were doing. Lobby leaders can now list their lobbies publicly, allowing everyone in the world to see and join them. 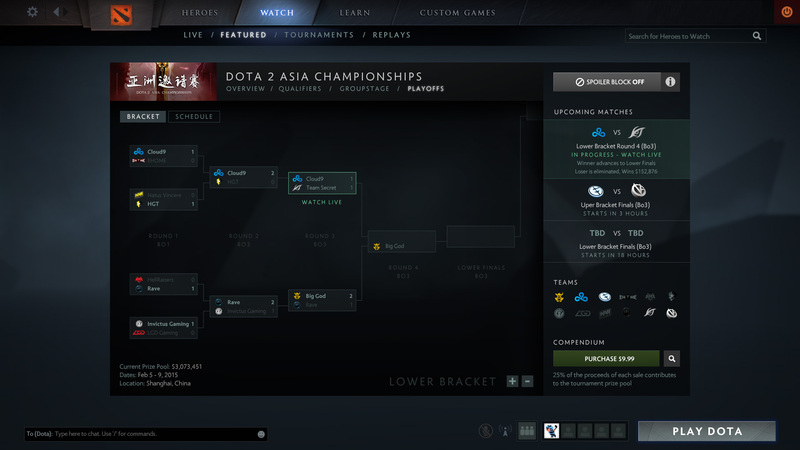 Players can search by lobby name or game mode, and also see which of those games are on their local network or have friends in them. 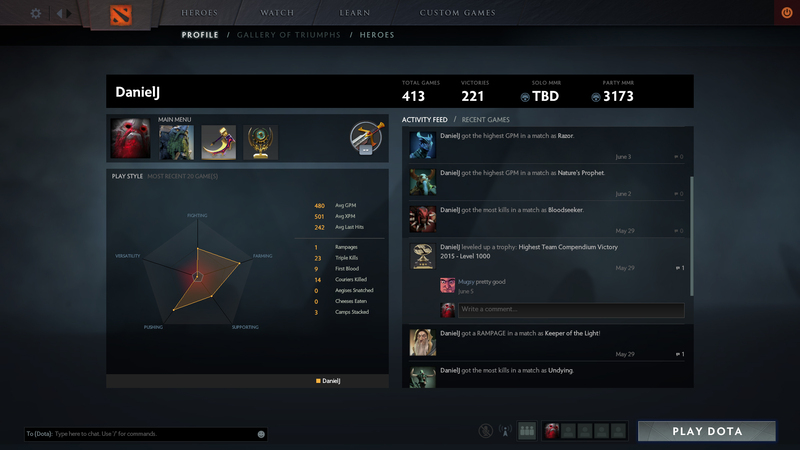 Dota is best enjoyed with friends. Several new tools have been built to make it easier for you to gather your friends for a match, and make the experience of communicating with them seamless. The Friends menu now allows you to more easily find out who's available or looking for a party, and send them an invite with a single click. 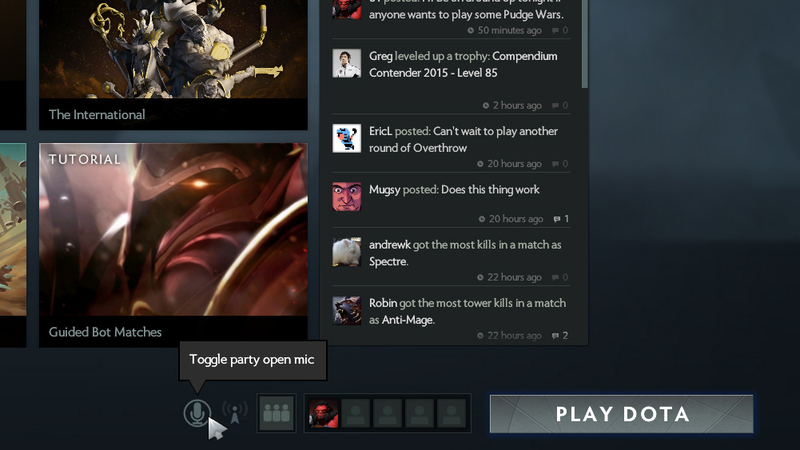 You can now use party voice chat in the dashboard and continue the conversation seamlessly while the game is loading. Does a friend have someone with them already? You can now directly merge two parties into one, or request to join someone else's party instead. You're also able to reassign party leaders at any time. You can now set yourself or your party to Open status, broadcasting to all your friends that you are searching for more people to play with. Explore your friends' playstyles, keep track of their accomplishments and comment on their progress. 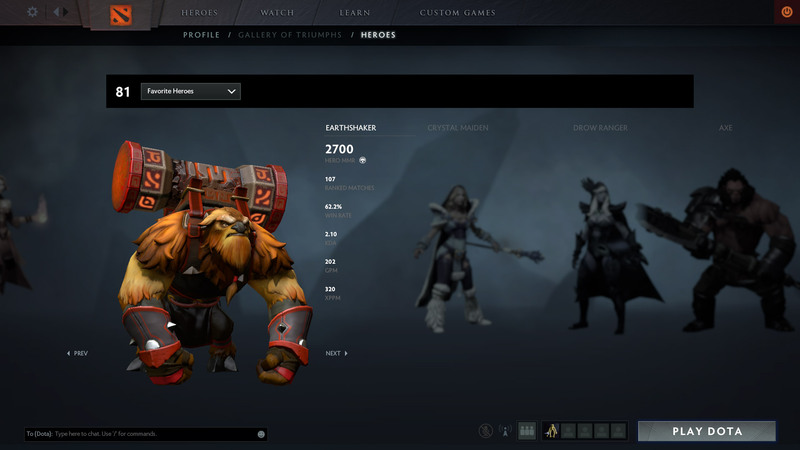 Mouse over a player's avatar in the new interface and you'll see their customizable miniprofile, where players can choose to show off their favorite hero's stats, most treasured items, or trophies. The profile also includes their Badge, which summarizes experiences and accomplishments into a single icon. The activity feed lets you quickly see and comment on your friends' accomplishments, giving you a place to celebrate a game-winning Black Hole and then quickly jump in the replay to see it for yourself. Delve deeper into a friend's performance by exploring their Hero MMR, a measurement of performance with an individual hero relative to their overall MMR. 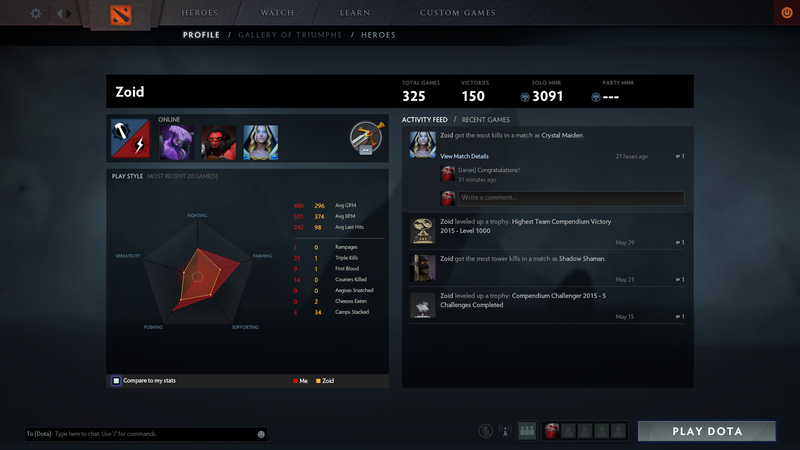 Your Dota playstyle is represented across 5 different axes, which can be used to compare yourself with your friends. The new chat interface is built with the goal of making it easier for players to form communities, and to help them get to know other players as they participate in more conversations. 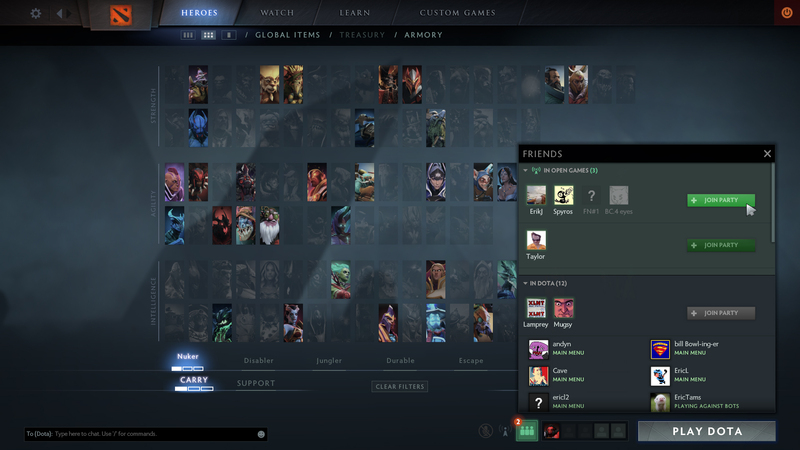 Use the Whisper feature to quickly chat with any of your friends on Steam and you'll see their reply in the new chat panel whether they're running Dota or not. You can now configure chat rooms to show their messages on all tabs, making it easier to follow many small chat rooms at once. Party and Whisper messages also appear in all tabs. The maximum number of people who can join a single chatroom has been increased to 5,000 to facilitate larger communities. Heroes are the heart of Dota. We revamped the Hero Browser in order to create a single location for you to learn about, practice with, and customize your heroes. It's now easier to search and sort through heroes using filters. Apply a Carry or Support filter to see which heroes work well in those roles, then filter further by specific roles such as Nuker or Jungler. You can also increase the strength of a filter to see which heroes function especially well in a particular role. 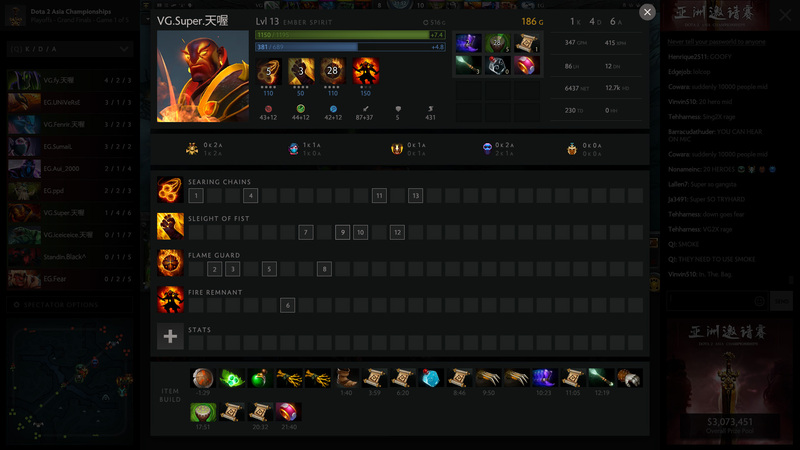 Hero pages now let you quickly browse and try on every set and item available for that hero. If you find something you like, use the purchase button to buy directly from the Dota 2 store or from the Steam Marketplace. There's also more information to help you determine if a hero is right for you, and a place to check out the community-written guides for that hero without needing to enter a match. 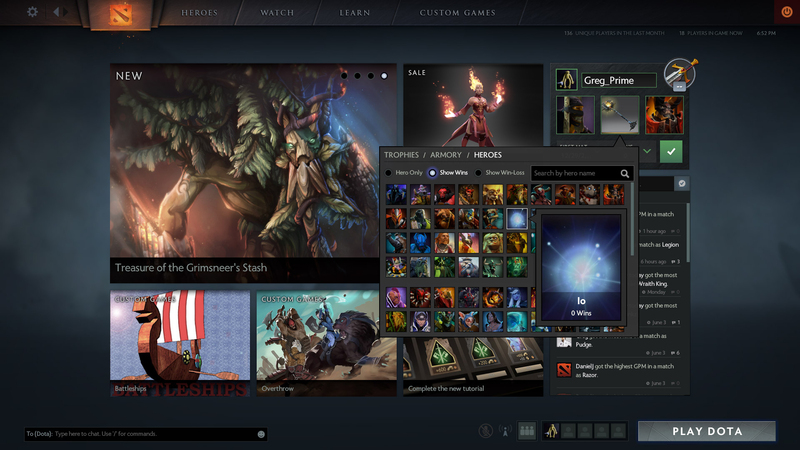 Each hero's page features a "Demo Hero" button, giving you quick access to a safe place to try out any hero's abilities and practice last hitting. The hero will also wear any items you have selected in their Loadout, giving you a chance to preview any cosmetic item in-game, including items you don't own. 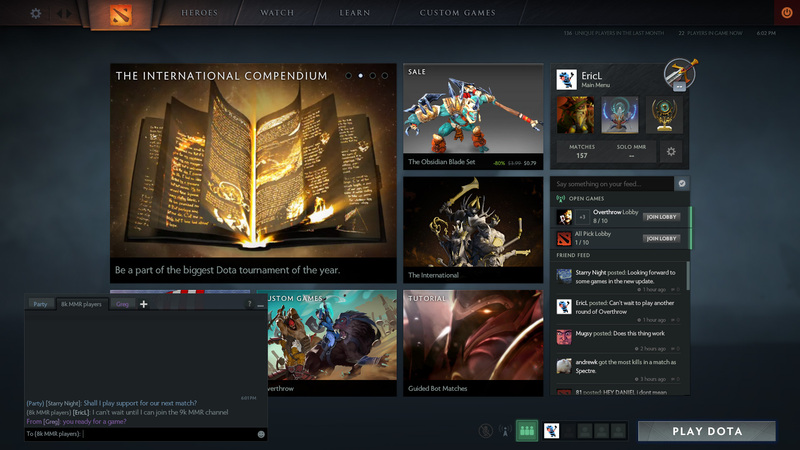 Watching Dota 2 is just as central an experience as playing. 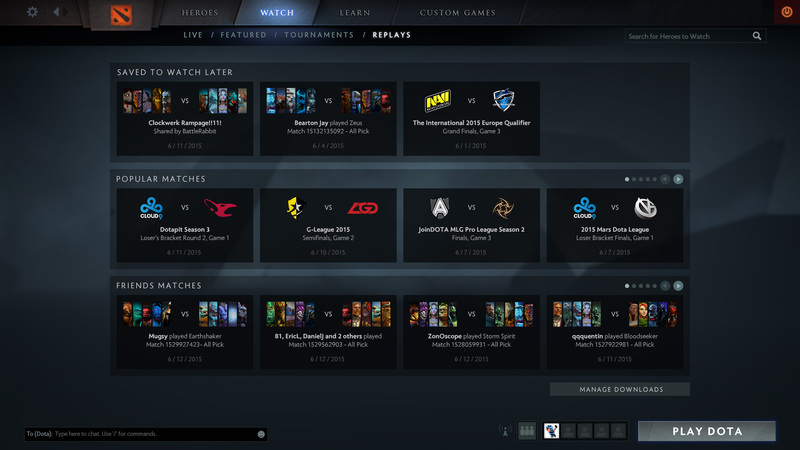 The Watch section has been redesigned to make it easier to find the matches you want to see and then enjoy the game with a revamped DotaTV experience. 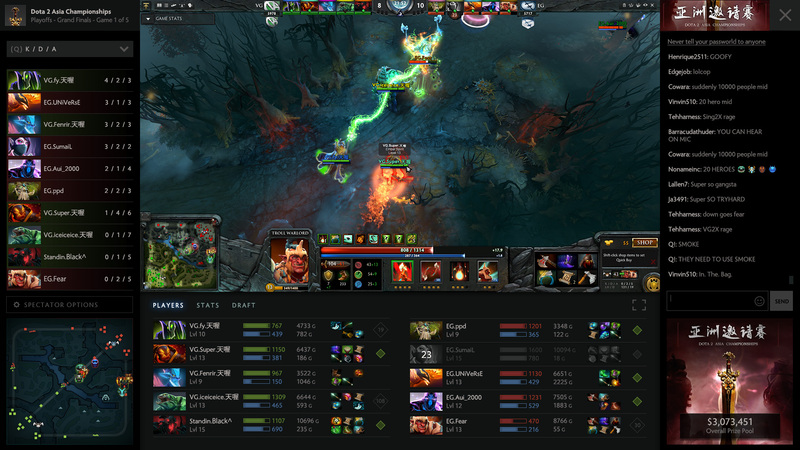 We're combining the best of DotaTV with the best of streaming. DotaTV, powered by Steam Broadcasting, will now provide detailed stats and graphs for you to browse while also supporting full tournament video production. 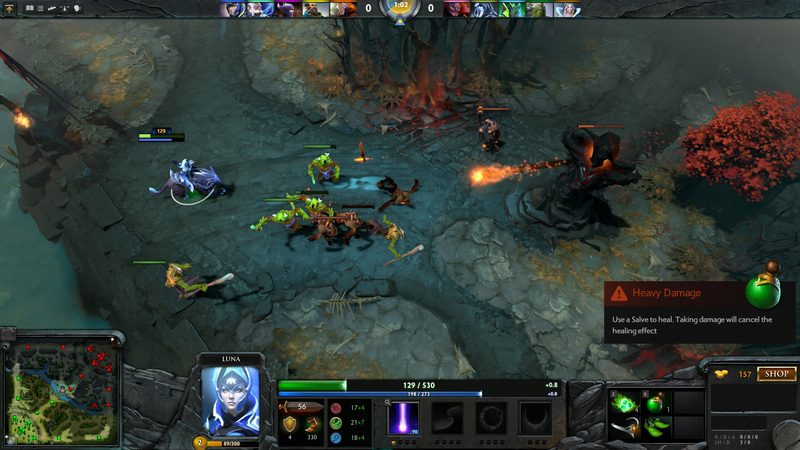 These streams are capable of 1080p at 60 frames per second, while carrying an embedded data feed for stats and graphs, and are accessible from inside the Dota 2 client as well as on the web. Need to pause for a moment or just missed some action? You can pause and rewind anytime you want. 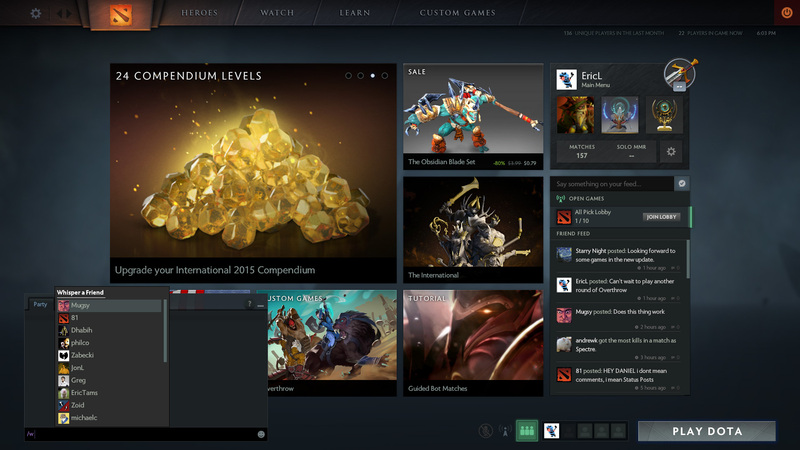 You will also find third-party streams for that game directly inside the client. 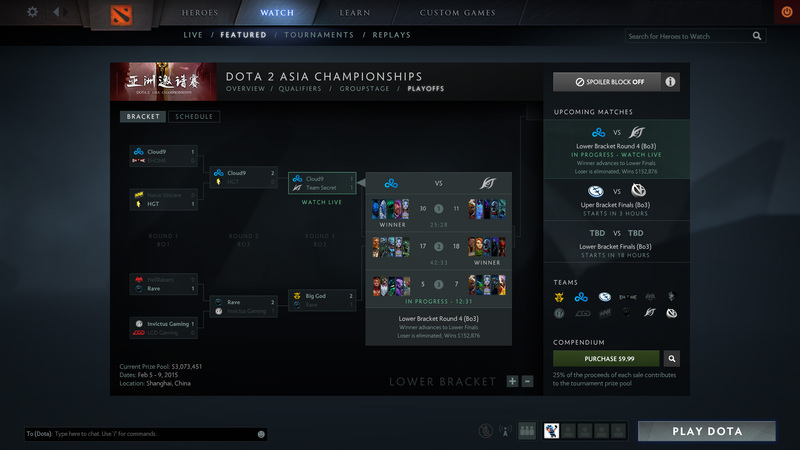 The Watch section now presents you with a mix of live tournament games, those featuring high-skill players, and matches your friends are playing or spectating. The new live match previews will also give you more information to help you decide which game to watch, including a detailed rundown of the state of the game, gold and experience graphs, and individual player stats. Heard of a big tournament in its final stages? You'll want to check out the Featured section, where you'll find all the information you need to jump right in and follow along, including the current bracket, upcoming games, participating teams, casters, and more. 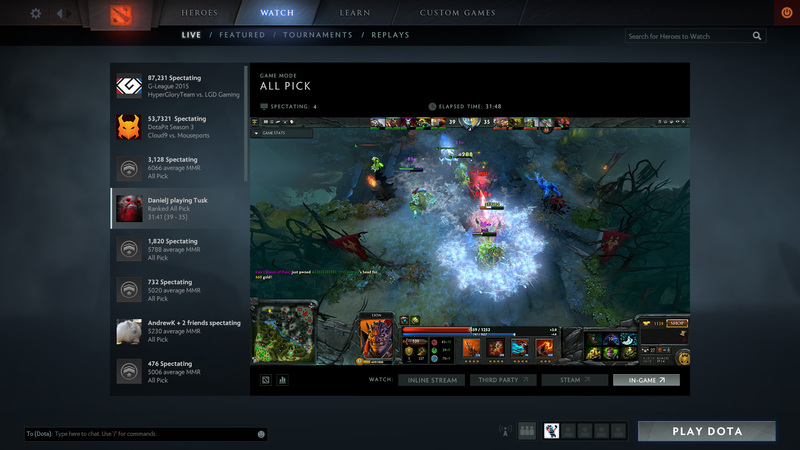 During a live match, you will be able to hit the "Watch Later" button to quickly bookmark it, letting you visit the Replays section to watch the game when you're ready. The Replays area will show you recently completed matches played by your friends, and the most popular replays rated by the community. 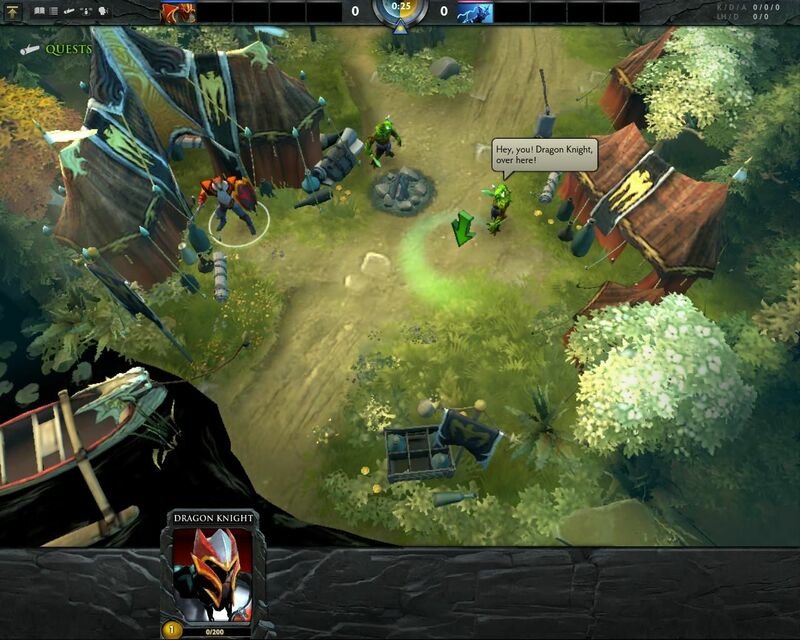 You will be able to add descriptions to your favorite replays and share them with friends. All replays will also have their own comments section, making it easy to discuss the best plays and most heartbreaking throws in any match big or small. Many of you told us that while our existing tutorials were good for teaching Dota's mechanics, they weren't great at helping new players understand why Dota is awesome. So we've built a new system of Guided Bot Matches, which allows a new player to jump right in and experience a full Dota game, all the while receiving guidance from an AI director. If you've got a friend who you'd like to introduce Dota to, but you balk at the teaching you'll need to pass on to them beforehand, then we've got you covered. Striking a careful balance between providing enough information to be interesting, and not so much as to be overwhelming, these tutorials should be fun and educational for any beginning player, and give them a taste of what it's like to play a full game of Dota. If you have friends who haven't played anything like Dota at all, and who find themselves struggling in the Guided Bot Matches, we've kept the ultra-simplified mechanics tutorials for them to fall back to. Here they'll be able to focus just on the raw control mechanics of Dota.